Places still available on GARP 2010 dig - see main web site for info. On the 75th anniversary of T E Lawrence’s death, three leading academic specialists assess his role in the desert war of 1916-1918 and his relevance in understanding the conflicts of the last 90 years. Neil Faulkner and Nick Saunders are joint directors of a pioneering new field project that is investigating the archaeological remains of the conflict along the line of the former Hijaz Railway. Jeremy Wilson, author of Lawrence of Arabia: the authorised biography of T E Lawrence, is widely recognised as the world’s leading authority on his subject. Together, on the basis of radically new evidence and interpretation, they offer a day of illustrated talks and discussion that will reassess Lawrence, his role, and his legacy. And they will draw some stark lessons: about the parallels between the failure of the Ottoman Empire in 1918 and the unfolding disaster of the ‘war on terror’ today. 10.15-11.30 Jeremy Wilson: A legend on record? The price of the conference for early bookings is £29 (before 15 April 2010). Standard booking price is £39. Telephone: 08456 447707 or 0208 819 5580. Copyright (C) 2009 Current Publishing All rights reserved. The Prospectus for this season's work in Jordan is now available - it may be downloaded via the front page of the main GARP web site. (Link to the right of this text). The Prospectus contains all the most important information about dates, plans for the season, logistics and costs, so please do have a look if you are interested in joining in with this amazing project. GARP web site just updated to include the CWA article by Anna Gow and Lisa Corti, (in Reports Section) and three articles by Neil Dearberg (in new History Notes section) giving his Australian perspective. On the 75th anniversary of T E Lawrence’s death, three leading academic specialists assess his role in the desert war of 1916-1918 and his relevance in understanding the conflicts of the last 90 years. Neil Faulkner and Nick Saunders are joint directors of a pioneering new field project that is investigating the archaeological remains of the conflict along the line of the former Hijaz Railway. Jeremy Wilson, author of Lawrence of Arabia: the authorised biography of T E Lawrence, is widely recognised as the world’s leading authority on his subject. Together, on the basis of radically new evidence and interpretation, they offer a day of illustrated talks and discussion that will reassess Lawrence, his role, and his legacy. And they will draw some stark lessons: about the parallels between the failure of the Ottoman Empire in 1918 and unfolding disaster of the ‘war on terror’ today. The price of the conference for early bookings is £29 (before 31 March). Standard booking price (after 31 March) is £39. Payment can be by cheque in the post (payable to Current Publishing) or credit/debit card over the phone: Current Publishing, Lamb House, Church Street, London, W4 2PD, 08456 447707 or 0208 819 5580. New Lawrence documentary in 2 parts. 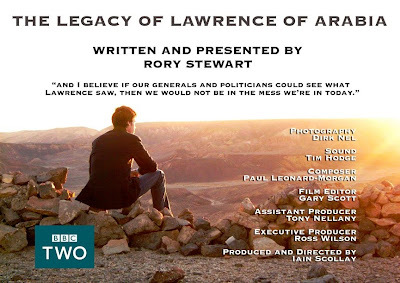 Hopefully the documentary will give a flavour of the work we are doing in Jordan and also provide an interesting perspective on the legacy of Lawrence.